Kyle Carpenter received a medal of honor (the highest military honor) after he jumped in front of a grenade while he was in Afghanistan to shield his fellow Marine from the blast. He did an interview with Fox & Friends for National Medal of Honor Day. Kyle Carpenter is the definition of valor. He suffered severed injuries to his face and body including the loss of his right eye. He was actually pronounced dead at one point during his recovery and fought for his life. What an honor to have such a heroic man like him to have served our country. We have such incredible vets! 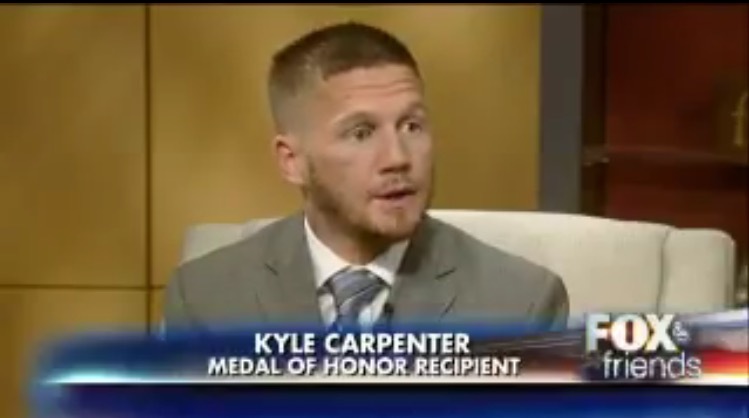 More more about Kyle Carpenter and his service here.